Talking about gaming, it is today considered as one of the most entertaining activity to pursue. Whether it is online games like multi-player games, browser game or First Person Shooter (FPS) games, all these games are being enjoyed by millions of people from all sort of background and age group. With each game, comes a unique learning curve and other secrets, which is why one can’t just jump into any game and play it at its best. Your will definitely require instructions to understand and play the game you wish to. So when it comes to online tutorials, passages, and another sort of game related things, one can take help from the big gaming communities around the world. There you can find video tutorials on any game you wish to play. Gamers around the world like to record their game and make video tutorials to help new gamers. These video tutorials help the newbies or noobs, to understand the basic and advanced features and strategies of a game. When it comes to recording games, there is one question that most of the people wonder about – How these gamers managed to record their gameplay with great quality? The answer to this pertinent question lies in the screen recording apps that are specially created for recording various gameplays. If you wish to record your own game, you can achieve that by using available game recording tools which can be paid or free. All you need is an updated PC along with the recording app downloaded to start recording. Here we have discussed top 3 game recording games for your Windows PC. OBS is considered to be the best choice when it comes to recording a game. This freeware which is also open-source allows numerous customization options. With its unique and simple interface along with all the necessary in front of you, you can easily record your games without making special changes to your settings. All you have to do is just select the source to record and begin the game recording session. You can also put stream live videos of your game on various popular platforms like YouTube, Hitbox, etc. or you can also save the recorded game output on your PC. This software is quite capable of recording in FLV and MP4 video formats and utilizes your PC’s Graphic Processing Unit or GPU, for high-quality live streaming. It also includes features like Picture-in-Picture mode, Push-to-Talk mode, custom watermarks, to name a few. These features will allow you to create video tutorials of various games. Geforce’s ShadowPlay is a great freeware for various purposes like live streaming or recording of your game. This tool utilizes the latest NVidia Geforce GPU rather than your own PC CPU for performance. This makes it certain that your own PC’s GPU don’t have to handle extra burden, which is also running the game. But you will require Geforce GTX 600or above to run this recording software. ShadowPlay comes with two different modes: Shadow Mode and Manual Mode. In the case of Shadow mode, your game play for last 20 minutes will be recorded, and the older will get deleted automatically. With the manual mode, you can record unlimited gameplay until you decide to stop it. You can also stream your video over Twitch and in case you want to preserve your gameplay, you can also save it to your PC hard drive. This game recording software, Action!, is a paid software which consists of great features. It utilizes your GPU to accelerate recordings and hence put relatively lesser pressure on CPU. You can also make a high quality video, from normal resolution to 4K resolution, along with high frame rates and you can also add live commentary by using this software. The recorded videos can also be streamed on a variety of websites such as YouTube, Hitbox, etc. It also allows you to save the videos to your PC too. This software also comes with remote access feature which will allow you to control your PC even with your Android phone and you can also play PC games on Android. Like ShadowPlay, it also comes with the Time-Shift mode, but it is restricted to 10 minutes only. You can edit, crop or add effects like slow motion by using this software’s basic editing features. With this, we put an end to our list of top game recording software which you can try to record your gameplay. There are other software too using which you can create great videos by using them, which we will present to you later. 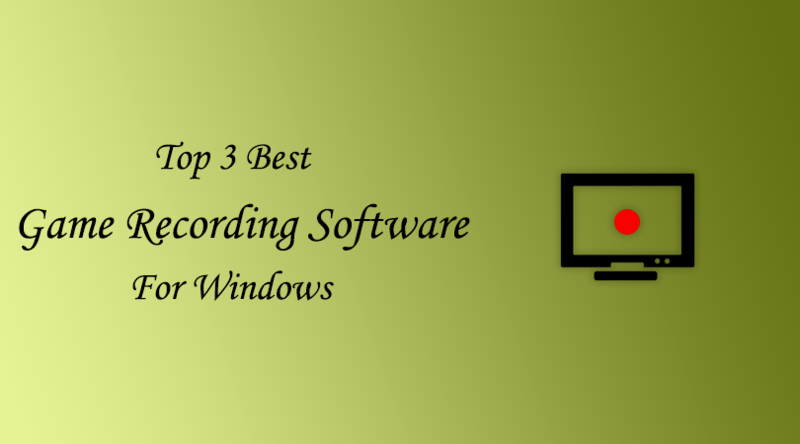 These three software covers all the aspect of game recording, and we suggest you these software based on their performance and capabilities. In case you decide to go with any of these software then do let us know about your experience and mention your views in the comment section below. Where is bandicam? 🙂 I’m using bandicam and I think it’s great. I use bandicam also. it is great, works really well. Nice sharing. I like to ,play game. All these software’s are really helpful. Great list. Thanks for sharing such an excellent article. Carry on.